The following image shows the Application menu. You can access the Application menu through the BIP icon at the upper-left corner of the Portal Designer window. Open an existing portal in the Portal Designer. 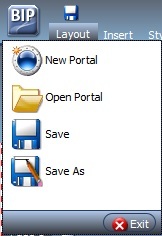 Save the current portal as specified.